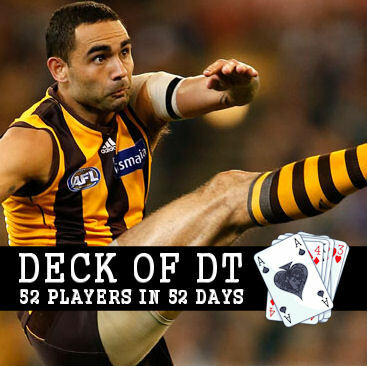 Ben flips over the third last card in the Deck of DT and it’s unique defender, Shaun Burgoyne. The answer is quite simple really, Hawks star Shaun Burgoyne, averaged 86.7 points per game across a full 22 games. To give that some perspective, he’s currently rated as a top 6 defender. Burger is ultra durable as well, missing just 4 H&A matches in the last 4 years. Whilst it’s very rare to be considering a 32 year old who just produced the second best seasonal average of his career, with the lack of depth and general oddity of the defensive top liners, Shaun may well prove to be one of the most dependable picks of your season. Last year, Shaun didn’t post a score under 70, getting a pass mark every single week. This is important not only because it helps keep your team afloat, but even within the topsy-turvy pricing nature of AFL Fantasy last year, he only dropped $12,000 under his starting price. Prices don’t generally mean an awful lot when you’ve bought a premium player and intend to keep him, but the next point may shed some light to the importance. Burger has developed a rather interesting scoring trend over the past 2 years. In the opening 2 months of each of the last 2 campaigns, Shaun has averaged 96 (10 points more than his seasonal average of 86) and 88 (again, 10 points more than his seasonal average of 78). Whilst these types of figures don’t have too much credence within limited trade competitions, this may be the determining factor in selecting him for AFL Fantasy. Finally, the Hawks magnet will enjoy a Round 11 bye. As keen fantasy coaches may have noticed, Round 11 already appears to have a dearth of defensive top liners. Chucking Burgoyne in may alleviate an undesirable donut down the line. Unfortunately, Hawthorn’s #9 does come with a multitude of question marks, which dismally hang over his head, with a general sense of fantasy doom. Firstly, the ex-Power star is now 32 years of age. Last season he defied his age to get back to premium status, but can this really be sustained? To continue in that vain, his scoring from year to year has been, at best, quite sporadic. His last 4 season averages before last read; 78.8, 72 and 71.7. This is largely due to him being swung from position to position, week to week. In fact, Champion Data’s figures suggest that Shaun spent 47% of game time in defence, 32% in the middle and 21% up forward, making him the truest utility in the game. With those figures in mind, we must duly identify that Shaun’s scoring may be reasonably roller coaster-like. Last season suggested differently, but he does have a history of shockers, including scores of 40, 44 and 47 just 12 months prior. Also it’s worth mentioning that although he didn’t drop south of 70, 31.8% of his scores were in the 70s, which isn’t an overly desirable trait in a fantasy premium. Lastly, to counterattack my prior argument, Burgoyne’s fast starts may be down to various factors out of his control, such as positioning or a simple statistical anomaly. While it’s probable that he slows down with the knocks that accumulate throughout the season, we must consider all potentialities. QUEEN- Burgoyne will not be a popular choice heading into Round 1. There seem to be an ever-mounting number of reasons why Shaun should be avoided. Yet, it must be maintained that under the correct circumstances, he may be one of the best half year plays of the season. The winning coach will get on a dark horse and undoubtedly reap the rewards. With regards to Shaun’s scoring potential, in an ideal world Hawthorn suffer a few injuries in the middle of the park to make Clarkson’s decision simple. Realistically, with Birchall now down and Suckling still on the comeback trail, Burger will start Round 1 on the half back flank. Who knows where the game takes him from there. Started with him in 2013, was cocky with my choice for those first two months… then the 40s came. Never again. A vital, big game player for the Hawks. If he’s playing chip chip in the backline nice for his stats but if the games on the line you’ll find him in the guts pushing, tapping ,blocking…..a genius at getting the ball out into space. Only really seems to work hard when he’s needed but is one of the match winners for sure. Anyway I though I would ask if someone could do Josh P Kennedy in the Deck before it concludes. He made the jump from sub-premo to almost uber-premo last year and comes at a price under what he is capable of due to his injured game vs St Kilda. Not sold him and would really appreciate if someone helped me out with some in depth analysis. Great read, rapt that you wrote up Burgoyne. Been on my mind all summer but after reading that he’s scrapped. Burnt me in the 2nd half of last year with some spud scores.